Self-described “neo-psychedelic” quartet Temples were named New Band of the Day in the Guardian yesterday and it’s not hard to see why the band from Kettering, England are attracting a lot of attention. The influence of psychadelia is seemingly everywhere in the UK at the moment (and no, not just in Liverpool), however where many bands have dabbled with and blended elements into their music, Temples take things a whole step further. 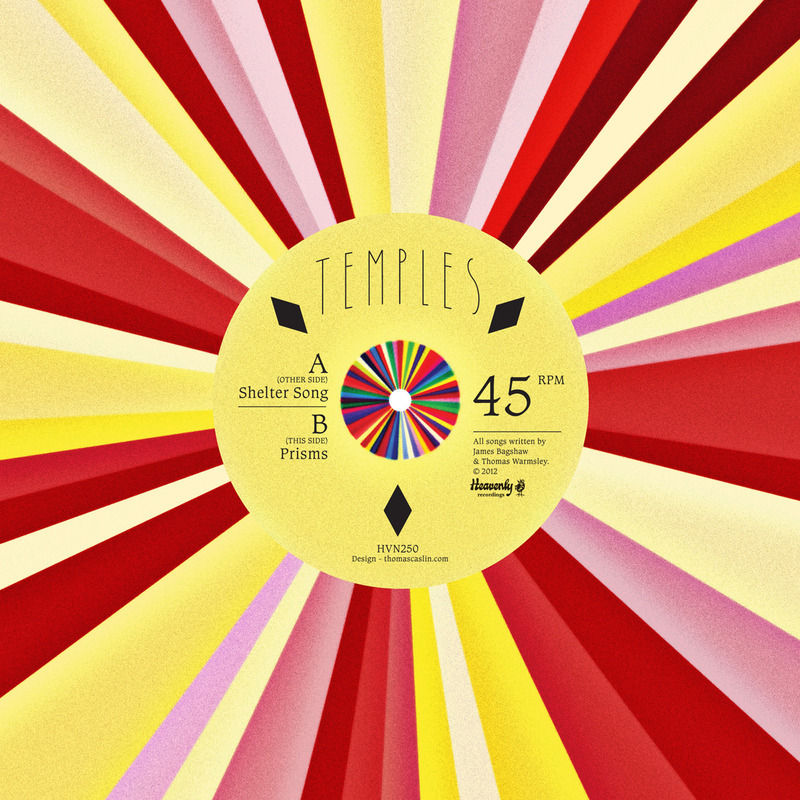 Kaleidoscopic visions and strawberry fields abound, Temples aren’t so much as incorporating psychedelic sounds into their tunes as setting out on a psychedelia revival. Apparently the band used vintage equipment to achieve their sound and I don’t doubt it. To these ears, Temples debut single sounds genuinely 60’s; think The Monkees, Beatles, The Velvet Underground, and The Byrds with elements of the brilliant new Tame Impala record (“Lonerism“) and you’ve hit the mark. “Shelter Song” might remind you of the first time you discovered The Mighty Boosh late one night on telly and heard The Call of The Yeti song. But while Temples may create tripped out music fit for Naboo and co., novelty aside, “Shelter Song” is expertly crafted and executed. Upbeat with beautiful and melodic guitar work, quirky keyboards, and lush dual vocals and harmonies throughout, “Shelter Song” is an avant-garde delight that emits Beach Boys summery vibes. Where the A-side is perfectly written pop, B-side “Prisms” is edgier and rather kooky like something from the original Willy Wonka movie. Another demonstration of both the band’s creativity and ability to authentically recreate the psychedelia from yesteryear, the B-side is a colourful collage (tie-dye, of course) of vintage organs, bossa nova-like beats, tamborines, and also some brilliant rocked out riffing. Quirky, avant-garde and thoroughly enjoyable “Shelter Song/Prisms” will be released digitally and as a 7″ single by Heavenly on 12 November, 2012. Pre-order now.